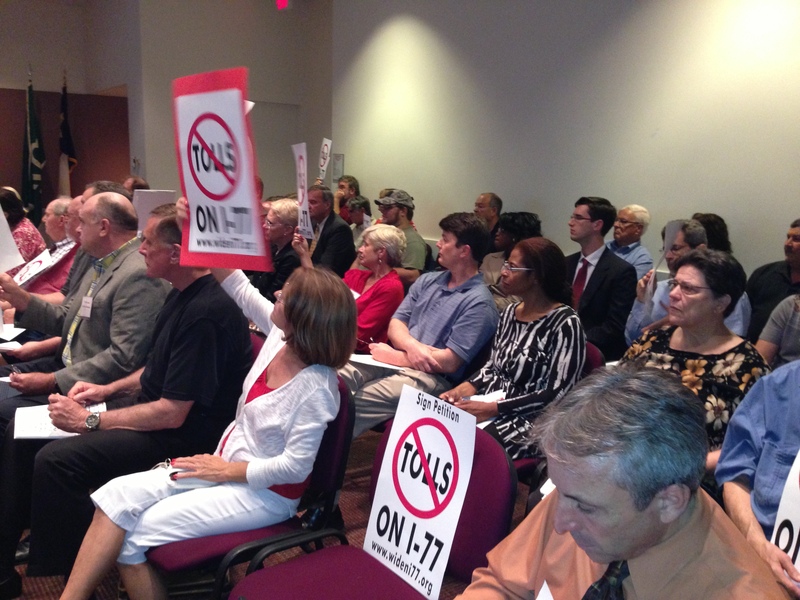 About thirty people made the trek to downtown Charlotte for the big MUMPO I-77 toll lane vote tonight (Wednesday). Eighteen people signed up to speak during the public comment period. Individuals are allotted three minutes apiece; groups have ten minutes. Before the meeting, MUMPO Chair Sarah McAulay came over to one of the citizens in the front row and asked if he was leading the I-77 group. He said he was there as an individual. McAulay then informed him the group would get ten minutes total to speak during the public comment period. So what should have been 54 minutes of comments was lopped to 10. People spoke up in protest. McAulay rapped her gavel and called the meeting to order. First item of business was approval of the agenda, which it summarily was. Next was the public comment period. Three people got up to speak- as a group- on the Monroe Bypass, which they did for 10 minutes. McAulay then asked who was speaking for the I-77 group. I stood and said I recognized four Widen I-77 members plus myself, and I would take that time for the group. I said the others- many of whom I had never seen before- were there as individuals and should be allowed to comment as individuals. At some point in that conversation, McAulay ordered me to podium. I said I this was not part of my public speaking time; I was clarifying the situation. She told me to sit down. I reiterated my point that there was one group and several individuals. Sometime during that exchange- it was hard to hear because folks were getting a little hot- she rapped her gavel and said our public comment period just ended. She moved on to the next agenda item. The room erupted in protest, with chants of “let us speak” and “first amendment.” Charlotte Commissioner David Howard suggested McAulay call security because the citizens were becoming dangerous. Another individual, prepared speech in hand, made his way to the podium. McAulay order him to sit down, which, after a few attempts to start his comments, he reluctantly did. Let’s pause for a moment and consider what could have happened. Any one of the MUMPO members could have made a motion to let the citizens have their speaking time. Recognizing the majority of people were their constituents, Cornelius Commissioner Chuck Travis and Davidson Commissioner Brian Jenest especially should have realized this and spoke up. So when the hubbub died down and the grumbling people finally filed out, the meeting went on. And not one citizen made a single public comment. I feel bad for the folks who drove all the way down to Charlotte only to witness the worst of an unresponsive bureaucracy. McAulay’s abuse of authority stands in stark contrast to the Cornelius Town Board, who a few years back patiently listened, deep into the night, to dozens of citizens voice their opinion on the Augustlee project. The sad thing is MUMPO doesn’t report to anybody. There’s no authority to appeal to. There’s nothing in their bylaws about the requirement for a public comment period. They don’t care what the public thinks. They don’t have to. Forget which side of the toll lane debate you’re on. What happened tonight was a disgrace. We need your help! If you like PunditHouse, please consider donating to us. Even $5 a month can make a difference! How Close Does Cintra’s Road Get To Governor Pat McCrory?